Mt. 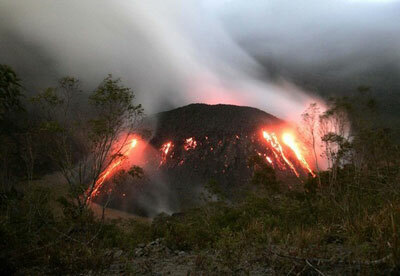 Kelud, located about 50km west of the city of Malang, erupted on 13 February, shooting a column of smoke and ash about 10km into the air and people in a radius of 10km have been evacuated. Ash rains started to descend in the early morning hours and winds have carried the ash clouds westward affecting cities as far as Yogyakarta, Surabaya, Solo and Semerang. The area around Mt. Kelud is not a prime tourist location, though the city of Malang in not to far distance is often visited by tourists and also serves as starting point of visits to the famous Mt. Bromo. While the area east of Mt. Kelud reported in the morning no further ash or dust descending, Yoyakarta was covered in ash and dust, and the airports of Yogyakarta, Surabaya, Solo and Semarang, which also serve international flights, have been closed until further notice. The temples of Pramabanan and Borobudur have been closed. Borobudur has been covered in cloth as protection against the descending ashes and will stay closed until further information from Conservation Department of Borobudur and Preservation of Culture Heritage of Jogjakarta. Over the day many domestic flights in Java have been cancelled as well as some of the International flights, including flights into Bali. All other major destinations in Indonesia, such as Bali and any islands further East, Jakarta, Kalimantan and Sumatra are not affected and are operating as normal.